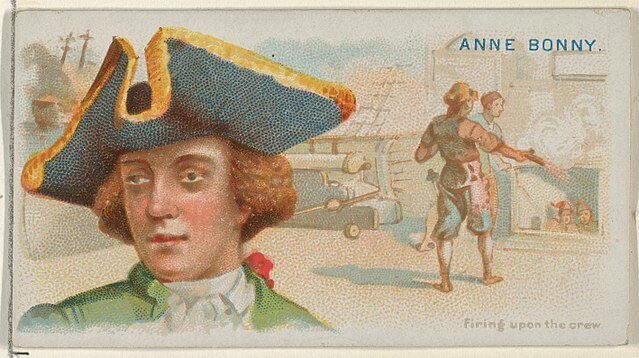 Anne Bonny (8 March 1702 – ??) 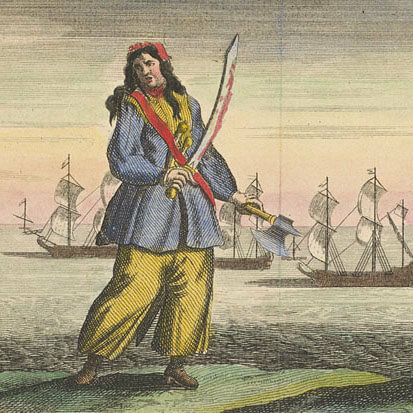 was an infamous female pirate and crew mate of 'Calico' Jack Rackham and Mary Read. Born Anne Cormac in Kinsale County Cork, Ireland. She was the illegitimate daughter of a servant and her employer, a lawyer named William Cormac. Most records of Bonny's early life are sparse with most of the information being available through Captain Charles Johnson's primary source document A General History of Pyrates (1724). She is known to have fiery red hair and a temper to match. It was rumored Bonny always had a temper growing up and at age thirteen stabbed a servant girl with a table knife. Anne Bonny moved to the New World very early in her life with the rest of her family. Shortly upon arriving in America her mother died and her father failed in his attempts to find work as an attorney. Eventually her father joined a merchant business and became much more wealthy. Eventually she married a poor sailor and small time pirate named James Bonny. At this point Anne had been disowned by her father and she could do nothing to win an estate. Between 1714 and 1718 Anne and James moved to the pirate haven of Nassau. 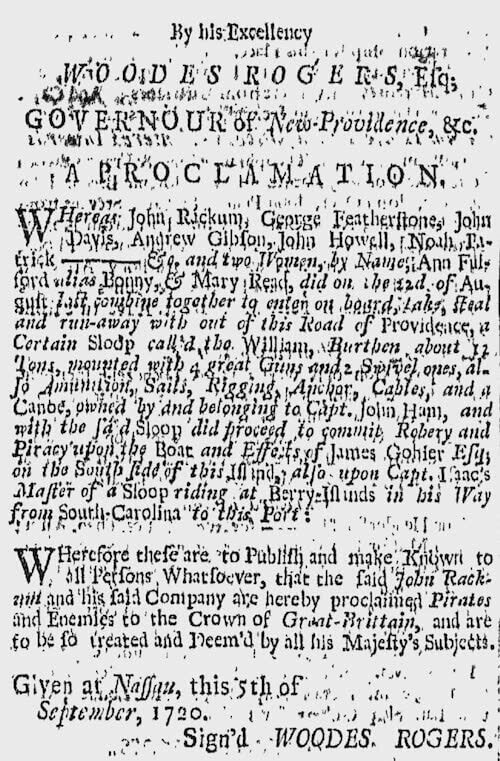 When governor Woodes Rogers issued the Kings Pardon (1718), both Bonny's took the pardon and James became an informant for Rogers. While in Nassau, Bonny met 'Calico' Jack Rackham and began an affair. The two sailed off together, even having a child in Cuba by the name of Cunningham. Bonny rejoined Jack and divorced her husband and married Rackham while at sea. Bonny and Rackham continued to pirate together throughout the Caribbean. While pirating around the Caribbean they encountered and recruited Mary Read and the love triangle drama the followed. Bonny was known to be exceptionally good in combat and did not even disguise herself aboard the Revenge. She earned the respect of her shipmates and everyone knew who she really was the entire time. She was even posted in Woodes Rogers proclamation along with Mary Read. Bonny, Rackham and Read did most of their pirating off the coast of British Jamaica, raiding small fishing vessels and the like. They captured many smaller ships that brought him to be at least on the list of wealthiest pirates, despite being one of the last ones. In October of 1720, Bonny was captured along with Mary Read and Rackham when the sloop, the Kings Ship captained by pirate hunter Jonathan Barnet under commission from the Governor of Jamaica. Rackham and the crew were drunk and possibly asleep at the time and Bonny and Read were the only ones left to fight off the boarding party. "Sorry to see you there, but if you'd fought like a man, you would not have been hang'd like a Dog." However, before Bonny and Read could be executed they both revealed to be pregnant and "plead the belly" meaning they were asking for mercy due to their condition. Both Read and Bonny were granted a stay of execution until they gave birth, the rule under English Common Law. The eventual fate of Anne Bonny is unknown. There is no recorded instance of her release or execution and it has been speculated her wealthy father helped get her release. She may have also escaped from prison and even resumed a life of piracy under a new identity. No one will ever know what became of Anne Bonny and her second child. She may have continued pirating or who knows.